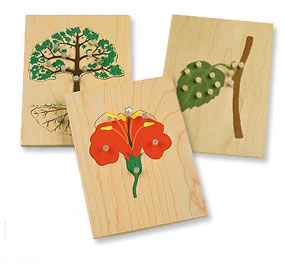 Children will gain first-hand experience learning about flowers, trees, and leaves from working with these beautiful, realistic puzzles. They will be drawn by the beauty of the material and will be led to a greater appreciation of the marvels of nature when they assemble the pieces of these puzzles. An informative control sheet gives important facts about the parts shown in these puzzles. 7½" x 10".